As important as your religious beliefs may be to you, they don't necessarily make you happier, a new study in the American Sociological Review finds. What does make you more satisfied with your life, the study finds, is having friends at your congregation and a strong religious identity. "Those are the people who give you the sense of belonging," said lead study author Chaeyoon Lim, of the Department of Sociology at the University of Wisconsin in Madison. Lim conducted the study with Robert Putnam, author of "Bowling Alone" and "American Grace." Many other studies have argued that the happiness gleaned from being religious is about spirituality and theology - for example, your belief in a higher power and your engagement in the rituals of your tradition. But in this study, factors such as prayer, holding religious services at home, and strength of faith do not appear to be related to life satisfaction. Lim and Putnam looked at a nationally representative sample of almost 2,000 people in the United States. The majority of the participants in the study were Protestant and Catholic; Jews, Muslims and other non-Christians were a smaller portion. They conducted interviews with the same participants twice: Once in 2006 and once in 2007. Those who gained friends in their congregations during the course of the year also reported a greater sense of life satisfaction. This was also true for those who said they were attending their place of worship more in 2007. But people who go to a place of worship and have few close friends there are not any happier than people who never go to services, the study authors found. Religious identity is also important, Lim said. People who say that religion is a very important part of self identity tend to be happier. And that also goes back to the friendship issue: It’s not simply the presence of friendship, but also the fact that you share this sense of religious identity with this particular social network, that makes you more satisfied with life, Lim said. 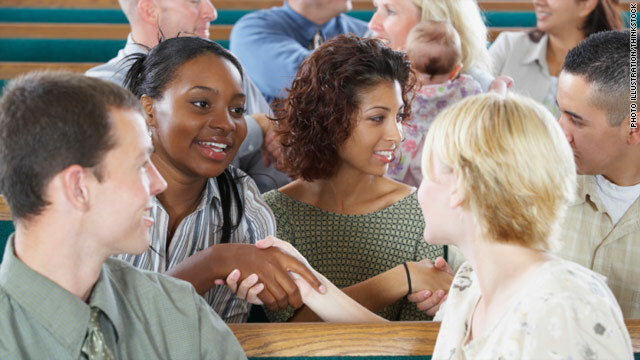 Friendship in congregation also appears to make people volunteer more, even outside of the religious setting, and donate more often to both religious and nonreligious causes, Lim and Putnam found. Still, it is worth examining in the future why this study did not find the same link between happiness and spirituality that others did, the authors say. This may have to do with how different aspects of religion are measured. For example, those who reported that they "feel God's love" seemed to have more life satisfaction than those who did not, but this did not apply for similar questions about belief in God. Also, it is impossible to draw conclusions about whether "feeling God's love" causes happiness or vice versa. Could other networks of people have the same effect on happiness? The authors say that if this is possible, it's hard to think of a non-religious context with a similar strength of identity, intensity of participation in ritual, and great scale and scope of the people in it. « Previous entryDo cell phones cause behavioral problems? I am a very happy atheist. Religion? You don't need religion to make friends, have morals or live a good life. I don't go to church, believe in a god and I have many friends and am quite happy. Then again I am also grounded in the reality of life and the connection of all living things. Me too, Ian. I know these simple facts won't sway anyone away from the teachings that were pounded into them by their parents/clergy....but it sure is fun to make them look foolish! It's good to have many friends and be happy. Be careful, Tom. Different strokes for different folks. No need to (give reason to) start a classic arguement that cannot end. Actually, it ends when/if God shows himself to someone. However, that's quite speculative, and different people see it in different ways, if at all. Or so I imagine. So actually, Atheists can't win and the religious cannot win by any means short of God making an appearance at the Super Bowl. Still, the topic is a pointless arguement that can never be debated with calm fact. Ignorance is bliss,apparently. Accepting full responsibility for one's life in 'real' world and facing up to the finality of death may be a bit more pestiferous and nerve-wracking than gazing at life–and a supposed 'after life'–through the rosy-lens of supernaturalism offered up by religion. Santa Claus brings happiness too to millions of people, but grown-ups know better. Got to go. Read up. Namaste. The Spirit of God surpasses all understanding and enters people into a peace and joy that only the fellow enlightened can understand. Those in darkness will never experience true joy and peace. Then stop trying to convert us. Those that believe there's a supreme being are 100% wrong. See how easy that is! 15) Followed by the daily suicide and/or roadside and/or mosque bombings every day in the terror world of Islam. I think we would all be happier if we heavily associated with only people who agreed with us. This isn't about religion, it's about the human desire to be correct; "You agree with me! So I'm right!" You might as well ask a Republican if he is happier around only Republicans or only Democrats. Go ask Kanye West if he would be happier around Beyonce or Taylor Swift. It's basic psychology, so I'm glad the article wasn't pushed as a scientific breakthrough. Keith... Sorry, last word. You said"...and who is saying that the Genesis account is to be taken literally?". Exactly my point. So who's to say what parts are real? If most of the Universe was created/banged-up within the first ten minutes of time, seven days is actually a very very very long time in comparison. Religion is a place to make business contacts, meet people in a new town but it has quirks since it attract phonies with similar interests. Religions are based on fairy tales. Fairy tales like Santa Claus stories I suppose have their place in driving capitalism and cheer for children. All religions have been designed to motivate people to a cause. Makes people believe in something like the pet rock principle and is non scientific and not based on facts. Hmm Chris. Time to take your evidence to the newspapers. I think they missed that important find of yours. But evidence abounds – you might want to repeat your 10th grade science classes if you can't see it. I couldn't agree more. Having a sense of belonging leads to happiness and the creation of better, healthier relationships in Christian life. God is the one who has given me joy peace happiness and every good thing 😀 attending church (willingly and not feeling obligated) is a plus. Being able to hear and read the LIVING word of God is awesome and having fellowship with my brothers and sisters is a plus. Its when you ALONE that God works in your life. The proof of Gods existance is everything you see with your eyes that AREN'T man made. How come humans are the only thing given free will to make good or bad choices? In the animal world its survival of the fittest how is it not the same way with humans? How is it that out of the billions of galaxies there is not ONE messily planet that can sustain life? Explain the complex organs and tissue and bone and joints were made this way? There is no logical way we have always existed through time hahaha there IS a creator. Do cars make themselves? No they have a creator just like we have a creator GOD. People are just selfish and want to do there own thing. I have no problem with that. It makes me sad but I can't give them the desire to seek God only they can. Just like I can want you to be successful but it doesn't me your going to want to be. You are the one who needs to have that desire. GOD is great and I love him more than any temporary material thing or a friend. God is my friend he speaks to me through his word. I can pray for him to help me understand a problem I'm having I open my bible then BOOM!! Scripture perfectly mtches up with what I'm asking for. Hahaha every single time. Ask and you shall receive. Doesn't mean say dear lord bless me with a Ferrari bam then your driving one to work the next day. If you ask for wisdom it will be given to you if you ask for forgiveness its given to you (his mercy is renewed daily) if you ask for understanding he will give it to you without reproach. Not like bless me with a thousand bucks or bless me with some sweet shoes a nice house and ten girlfriends.... Those are all selfish things. You will never get them. But through obedience God WILL bless you. Its his promise (for heaven will poor out such a blessing that there won't be room enough to contain it) hahaha that's awesome all in all anyone can do what they want that's why its called FREE WILL. I'm not perfect and no one will ever be only god is (for all haved sinned and fall short of the glory of god) I just hope and pray that everyone be blessed. I love you all. Open up a bible and pray for God to reveal himself to you and he will without reproach. He love is all. Soo, why does your god not tell everyone the same thing when they are alone? Nobody comes up with the same religion all by themselves. You would think you all would notice big important clues like that. A few points. These threads would be far more productive if they were approached as a dialectic rather than a debate. ( I speak to both the Christians and the Athiests and by the way Atheism is a religion too) We all need to understand each other by looking at their beliefs from the others world view or paradigm. There are lots of distortions and abuses of all ideologies including Atheism and it does no good to paint all with broad dismissive strokes or to point to distortions and excesses as the fundamental truth of an ideology. That's just ignorant and arrogant. So you know where I am coming from, I am an Orthodox Christian, This is a whole other topic but properly understood Christ is the end of religion. Someone posted that the Muslims were the center of science. Actually I think you are probably talking about the Persians and before them the Babylonians. Intellectual pursuits kind of declined in that part of the world after Mohamed enlightened them. It started with the destruction of the Alexandrian Library the greatest single compendium of knowledge in the ancient world. Historical Christianity always considered the pursuit of scientific knowledge and truth to be very important. It also considered knowledge pursued and obtained by the faculty of the heart (Gk nous) to be a separate endeavor. I can't get into the whole issue here but what can truly be known about God cannot be attained by thinking about Him it has to be first revealed and then the intellect can work on it. History is replete with instances of those who would try and think up something without first having experienced it. In the 12th century a Roman Catholic theologian, Thomas Aquinas articulated that the intellect was the highest faculty of man and was the sole means of communion with God. This was a pivotal paradigm shift that took place in the west and set the tone for all subsequent Western pursuits of knowledge, both scientific and theological. It also changed Western Christianity substantially. I for one don't accept Aquinas' axiom. Any intellectual should at least read the debate that ensued between Gregory Palamas Bp. of Thessolonica and Barlaam (disciple of Thomas Aquinas) to inform themselves about how the drastic change in the way we think esp. here in the west occurred. Having said all that and having experienced everything from fundamental Christianity to Atheism and now Eastern Christianity I would have to say that a)what the survey discovered is real, b)you won't find it in every church c)It isn't just happiness or contentment or a sense of community and comradery (ie. military)that they are looking at but rather those are just symptoms of a deeper connection and oneness that is not found elsewhere. The Greek expression for this that was used to express it in the Bible, koinonia, does not have an equivalent English concept. Very learned, very impressive. Also spectacularly wrong. You've ignored the bio-chemical similarity between faiths and the fact that any of them can produce religious bliss or unitary being experiences. In fact, you can get the same group satisfaction from transcendental meditation, which also uses repeated structures, sounds, phraseology and ceremony to cause religious fervour, due to a partial disconnection of the posterior parietal lobe. There is no right religion. There are lots of right things about group behaviour, and religion often encourages them. But in and of itself, they're all logically wrong, as they're all mechanisms to achieve the same ends, regardless of the society in which they exist. Paul – You lost me after the word "dialectic". Who uses that word? I'm sure you are a nice person, but your paragraph started looking like blah, blah, blah. Nothing better than an open-minded debate. "Those are the people who give you the sense of belonging," bingo...I remember when I was young my mom was randomly like "We all need to go to church!" ..present day from what comes out of her mouth she most certainly doesn't believe (at least in their definition of god) whatsoever.....almost mocking at times. yet they goto church every Sunday, my sister is involved in the church, mother takes part in church activities, etc. I always say to them "Don't you hear the stuff that comes out of your mouth? You have to realize this is bs" ...and they just give me some cryptic smile. They know why they goto church, it gives them a sense that they belong to something. My mom also knows damn well if she actually truly admitted her beliefs she'd be all out of friends (shoulda seen the way one of her friends looked at me when I recited bible quotes during a xmas party...she obviously never read it...but they looked at me like I was an horrible human being...because if they weren't TAUGHT about it, it isn't in the bible....digressing...) and so would my sister (catholic school)...it's, well, a cult.